Choose from two devotional books and one Bible study. Life’s A Garden… Bloom Where You’r e Planted is a book of Christian devotional writings and plant photography with a special appeal to gardeners and plant lovers. This book is a blend of devotional and coffee table book. During her times with dirty hands the author has learned many of what she considers to be her life’s most memorable lessons. Weeding, dead-heading, mulching, pruning, planting; these are the times she has been most likely to hear that still, small voice revealing a simple, yet profound truth, always in an analogy of what she was doing with the plants or the soil. Those truths have changed the way in which she lives her life, the manner in which she relates to her family, the way she views the lives of others, and especially her relationship with God. In this book, she shares some of her favorite stories, revelations, blessings, memories, and photos of her plants. 36 pages of devotional writings and plant photography. Available in softcover and hardcover formats. Click here to purchase. In The Master’s Garden is Janet’s second Christian devotional book, written in the same format as Life’s A Garden… Bloom Where You’re Planted. 62 pages of devotional writings and plant photography. Break Up Your Unplowed Ground: Unearthing God’s Desires for Your Life is the first full-length book written by Janet Benson. This six-week Bible study is designed to be used as either an individual study or in a small group study setting. The book is based on Hosea 10:12 and is designed to encourage readers to pursue a breakthrough in their spiritual life. It challenges the reader or study participant to discover the unexplored spiritual territory where God wants to lead them. 316 pages available in paperback or in e-book format. Click here to purchase Break Up Your Unplowed Ground in paperback. 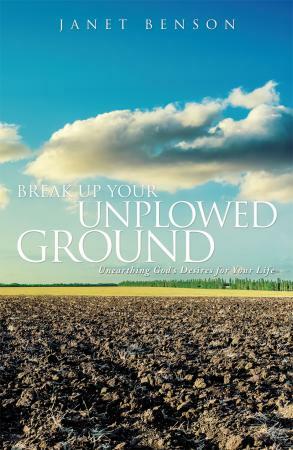 Click here to purchase Break Up Your Unplowed Ground in Kindle edition. Click here to purchase Break Up Your Unplowed Ground in NOOK format.